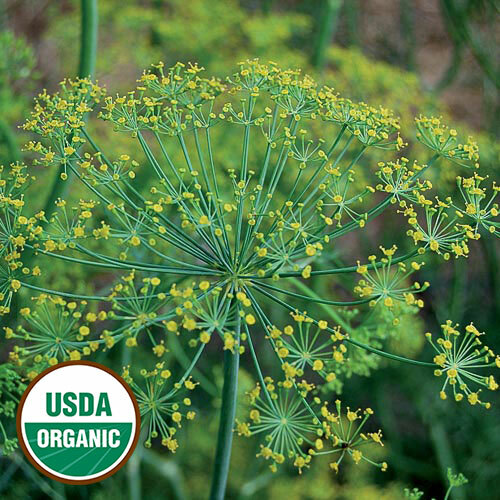 (Anethum graveolens) This widely grown dill variety is a prolific producer of edible flowers, leaves, and seeds, all of which can be used for flavoring everything from pickles and salads to sauces and condiments. Early-maturing plants have dark-green leaves, 6" flowering umbels, and an intoxicating scent. 45-55 days to leaf harvest, 70-90 days to seed harvest. Instructions - Sow seeds outdoors early in the spring when the ground has warmed. Prefers rich, well-drained soil and a sheltered location out of the wind. Will readily volunteer each year from dropped seeds.